The global BYOD and enterprise mobility market continues to experience impressive growth. Preparing for this transformation is more than just a matter of security. It’s a matter of leveraging the people, processes and tools needed to become a Mobile First organization that’s ready to explore a whole new opportunity landscape. 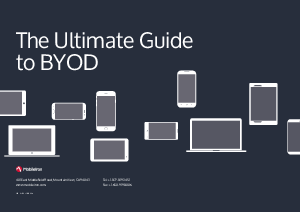 This BYOD guide is a great first step toward achieving your mobile transformation by implementing a successful BYOD program. By following the recommendations in this guide, you can deliver a program that meets the needs and preferences of mobile workers, while upholding corporate security and budget requirements. But the true success of any BYOD program depends on its long-term sustainability, which means you must ensure the security of your corporate data, drive user adoption by supporting employees’ device preferences and maintain a flexible technology portfolio that enables business innovation.